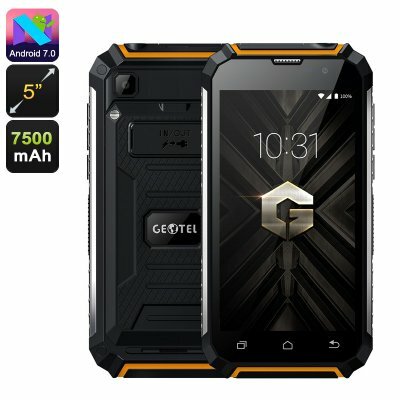 Successfully Added Geotel G1 Android Phone - Quad-Core, 2GB RAM, Android 7.0, Dual-IMEI, 3G, 5-Inch HD Display, 7500mAh, Google Play (Orange) to your Shopping Cart. The Geotel G1 Android phone is a sophisticated cell phone that follows you anywhere you go. This rugged smartphone features a durable IP68 body. Thanks to this, you won’t have to worry about it accidentally getting wet or dusty. This rugged phone is fully protected against water, dust, and drops. It will follow you into the toughest of environments without you needing to worry about the well being of your phone. With its whopping 7500mAh battery, it treats you to an unbelievable 24 hours talk time and a month worth of standby time. The battery can additionally be used as a power-bank to charge other electronics. This waterproof smartphone comes with a beautiful 5-Inch HD display. It packs a Quad-Core processor along with 2GB RAM to meet all your smartphone needs. With its 16GB ROM and 32GB SD card slot, there will be plenty of storage available for you to keep your files and media. The phone runs on an Android 7.0 operating system, thus guaranteeing a smooth user experience. With its Dual-IMEI numbers and 3G support, you can enjoy great connectivity anywhere you’re at. The phone even lets you shoot great pictures and stunning 1080p video with its intergraded 8MP camera. The Geotel G1 rugged phone comes with a 12 months warranty, brought to you by the leader in electronic devices as well as wholesale Android phones..